Many universities use Moodle as a complementary medium of lesson delivery to extend learning beyond the classroom. However, the merits of using Moodle will not be realized if students fail to use this learning platform. This article investigated essential factors and gender differences that influence students' decisions to use Moodle. 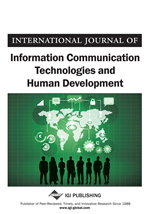 Technology acceptance model (TAM) was integrated with Moodle enjoyment and quality of internet connection factors to form the theoretical framework of this study. Data collected from 327 randomly selected students were analysed using structural equation modelling (SEM). The results showed that quality of internet connection has the greatest effect of β = 0.86 on behavioural intention while Moodle enjoyment has the highest impact of β=0.74 on actual Moodle usage. Furthermore, findıngs revealed that significant differences (t =1.77, p = 0.05) of Moodle enjoyment influence on behavioural intention exist between genders. The findings serve as a guide for planning, designing, and implementing Moodle as e-learning for students in universities. Many universities have incorporated the Modular Object-Oriented Dynamic Learning Environment (Moodle) to support and assist students learning. Moodle is the most widely used open-source e-learning platforms that provide an opportunity to design course website (Cole & Foster, 2008). Currently, Moodle is being implemented in 236 countries and has introduced 12.28 million courses, with 104.74 million users and 217.67 million forum post (Moodle.net, 2018). The introduction of Moodle has removed mundane style of posting PDF files on an individual web page to develop and design courses that extend student teachers interactions beyond the classroom. As a result, university instructors have been empowered with flexible tools that may enrich collaborative learning and improve educational outcome. Moodle features include files uploading of various formats, forums and messaging system which provides a social environment for students’ interactions. Its platform allows the exchange of knowledge among students despite their location and enables them to learn at their own convenient time (Fix, Kolesnikov & Petrova, 2015; Costa, Alvelos & Teixeira, 2012). Students who frequently use Moodle during their school days appear to obtain better results than those who hardly use it (Martín-Blas & Serrano-Fernández, 2009). Successful implementation of Moodle should reflect social constructionist approach (Wu & Hua, 2008) where students actively use it in their learning process to construct knowledge through the interaction with teachers and peers. Therefore, understanding factors that influence students’ use of Moodle is a very important issue. Several adaptation models in the literature have been proposed to explain students’ reasons for accepting and using Moodle. Most of the models used new factors or combined with previous factors to examine students’ intention to use Moodle (Damnjanovic, Jednak, & Mijatovic, 2015; Escobar-Rodriguezn & Monge-Lozano, 2012; Sánchez & Hueros, 2010). However, to the best of our knowledge, there has not been an in-depth investigation of Moodle adaptation in Cyprus although the Moodle is used in almost all the universities. Notwithstanding, the effect of technology enjoyment on user attitude and intention has been examined (Padilla-MeléNdez, Del Aguila-Obra, & Garrido-Moreno, 2013). But from keen observation, there is very little exploration of its effects on actual system usage specifically on Moodle. Moreover, these previous studies on TAM has tested or considered the quality of Internet connections as one of the factors that influence students’ decision to use Moodle. Furthermore, gender has been considered as one of the important variables in explaining the humans’ acceptance behaviour of technology (Goswami & Dutta, 2016). However, Wong, Teo, and Russo (2012) explained that the relationship between perceived usefulness, ease of use, and behavioural intention are not moderated by gender because the frequent use of e-learning system bridges the gap differences between sexes. There seem to be contradictory results of some previous studies which considered gender perspective when evaluating TAM model and enjoyment. Some of the results indicated that enjoyment and ease of use have a strong influence on the female attention of using systems than male (Padilla-MeléNdez, Del Aguila-Obra, & Garrido-Moreno, 2013; Terzis & Economides, 2011). Some studies concluded that males’ usage decisions are more positively determined by system usefulness (Okazaki & dos Santos, 2012; Kim, 2010; Ong & Lai, 2006; Nysveen, Pedersen, & Thorbjernsen, 2005). Further, Chou et al. (2011) found that enjoyment has a positive impact on male attitude toward acceptance of internet related technology than females. In addition, other findings claimed that gender difference is not significant or does not influence by Internet adoption and use (Foon, and Fah, 2011; Ainin, Lim, & Wee, 2005). Therefore, examining gender influence on students’ use of Moodle is of importance.